5 Scorching-Hot High-Yield Dividend Stocks -- Are They Stocks to Buy? These companies pay more than double the market's yield, yet most aren't worth purchasing today. Many investors aim to pad long-term capital gains by reinvesting their dividend payments. That strategy boosts overall returns in any case, but it works best if you start with a high-yield stock -- preferably one that raises its payout over time. Below, we'll look at a few companies that pay more than twice the S&P 500's 2.1% yield and zero in on which ones are worth adding to your watch list. Data source: S&P Global Market Intelligence. Most of these high-yield stocks have red flags (like unsustainable payouts or falling profits) that investors will want to keep an eye on. Seagate (NASDAQ:STX), for example, currently pays out more than it generates in earnings. That's a recent phenomenon as the hard-drive specialist's payout ratio was less than 50% in each of the past three fiscal years. However, profit is falling sharply on slumping demand for smaller-capacity drives, so management is slicing expenses by reorganizing its business around ultrahigh-capacity storage devices. In that cost-cutting environment, raising, or even maintaining, Seagate's market-beating dividend won't be high on executives' priority list. Cedar Fair (NYSE:FUN) also pays out more than it produces in net income, although that's more of a strategic choice for the theme-park operator: Its annual distributions have been greater than earnings since 2013. The problem hasn't been falling profits but dividend boosts that have far outpaced earnings growth. As encouraging as its attendance and average guest spending numbers have been, that dividend trend can't continue for long. Earnings will need to catch up to the dividend for income investors to have confidence in continued payout growth. Office-supply retailer Staples (NASDAQ:SPLS) isn't a good dividend buy for a simple reason -- its weak payout history. The company's $0.12 quarterly payout hasn't budged since 2013, which is around the time that its comparable-store sales began trending lower, and they haven't rebounded yet. With its industry shrinking rapidly, Staples has bigger problems to worry about than dividend growth, and so income investors should look elsewhere. That leaves us with two retailers on this list: GameStop (NYSE:GME) and Kohl's (NYSE:KSS). Both stocks have been decimated lately, diving 40% in the last year, as Wall Street frets about their future. 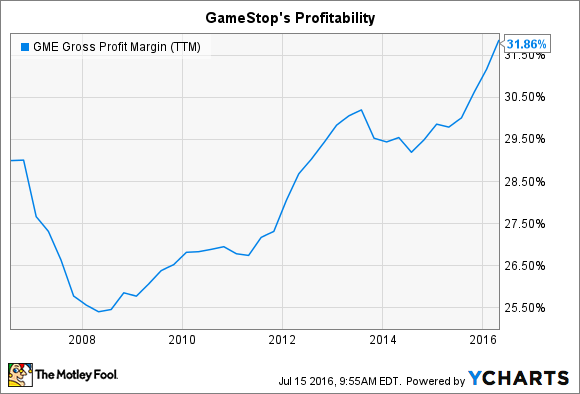 And while it's true that neither stock is ideal, GameStop looks like the better bet here. After all, the video-game retailer's profits are rising, having just hit a first-quarter record in May. Profitability is expanding, too, with gross margin spiking as consumer electronics sales expand to take up more of its business. GME Gross Profit Margin (TTM) data by YCharts. In contrast, Kohl's gross margin is at a 10-year low as slowing customer traffic has forced it to ramp up price discounts. Sure, GameStop's traditional video-game niche will be toast as the gaming industry shifts to digital sales and destroys the retailer's core buy-sell-trade model. Yet CEO Paul Raines and his executive team have been preparing for that eventuality for years, most recently by pushing into related product lines like smartphones, tablets, and collectible gaming merchandise. Management targets producing more than half of profits from sources other than disc-based video games by 2019, and the company is making big strides toward that target. In the meantime, investors don't have to worry about an imminent cut for GameStop's dividend. The company expects to produce a record $4 per share of earnings in 2016, which should easily cover the $1.50 per share it has promised in dividends. Because of the baggage they bring, high-yield dividend stocks often require additional scrutiny during investment decisions. But by limiting the focus to financially solid companies, investors can weed out the less desirable stocks and lower their risk of being burned by a dividend cut.